"Hitting 20 years is an amazing milestone, and it's been incredible to watch just how much Seamless has positively impacted not only diners' lives, but the restaurants and delivery partners we've worked with through the years as well," said Matt Maloney, founder and chief executive officer, Grubhub, which merged with Seamless in 2013. "Seamless pioneered online ordering and delivery and we've been through it all - the good, the bad, the snowstorms, the heatwaves. We're excited to spend this special year giving back to the people of New York." Free Seamless, anyone? 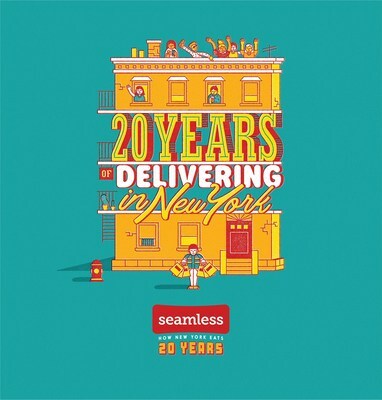 Music to any New Yorker's ears, starting February 20th NYC diners can enter to win 20 years of free Seamless. * That's… a lot of free Seamless. And if you're not selected as the lucky winner, don't fret - 20 diners will also win one year of free Seamless as a "consolation." To enter, use the code 20YEARS at checkout when you order from a NYC restaurant using your Seamless account, either online or in app, February 20th - 27th. Winners will be announced March 4, 2019. The more you order, the more you're entered to win! Seamless <3 NYC. Launched in October 2018, the Seamless "Donate the Change" feature, which allows diners to round their purchases up to the nearest dollar to support a charitable cause or public interest organization, will support NYC Kids RISE. A non-profit organization, NYC Kids RISE aims to make attending and graduating from college and career training more achievable for all NYC public school students—regardless of where they come from or how much their families have in the bank. Starting today through February 28th, Seamless diners can donate to NYC Kids RISE through Donate the Change to fund college scholarships for NYC public school students. Additionally, as a "Made in New York" company as designated by NYC Digital, Seamless will be building a catering search page that highlights locally-owned restaurants available for craft services for all NYC productions. Seamless has driven billions in food sales to local restaurants and has provided over a billion dollars in tips to drivers as well. Seamless delivery partners have driven, biked, and walked enough miles to cover the Macy's Thanksgiving Day Parade route over 32 million times, run the New York City Marathon over 3 million times, and cover NYC's subway tracks over 95,000 times. Seamless has delivered to some of the city's most iconic buildings, including Carnegie Hall, Rockefeller Center, Yankee Stadium, Empire State Building, New York Stock Exchange, New York City Library, Electric Lady Studio, Radio City Music Hall, and many (many!) others.